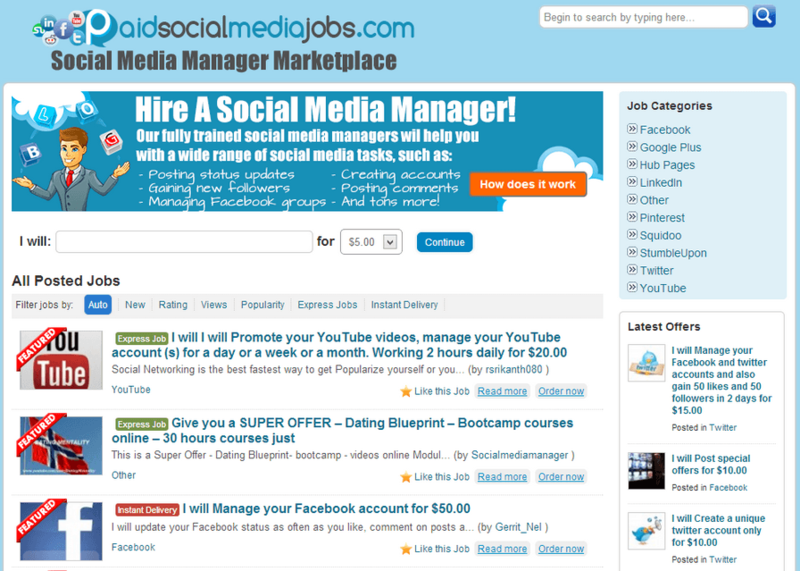 Paid Social Media Jobs found at paidsocialmediajobs.com is a marketplace for freelancers to get jobs on social media projects. Is it legit? Is Paid Social Media Jobs a scam? Let’s find out in our Paid Social Media Jobs review. 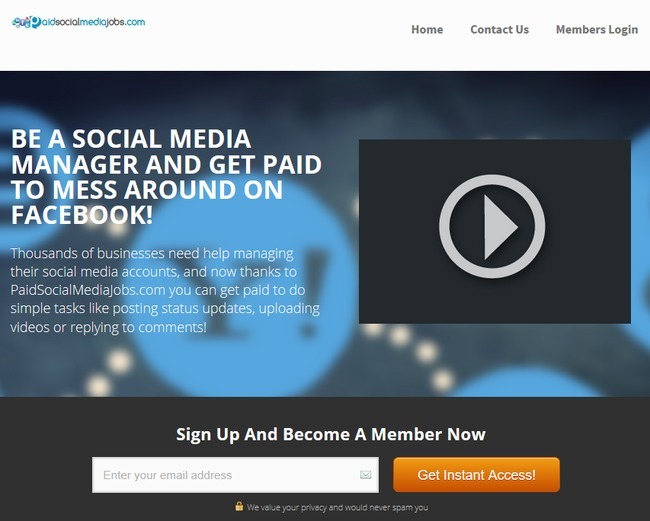 Paid Social Media Jobs positions itself as a centralized marketplace to get simple jobs like posting status updates, uploading videos or replying to comments. While it’s true that there are social media jobs out there, it’s not nearly as simple as Paid Social Media Jobs wants you to believe. As social media gets more important for companies to brand themselves and to engage with customers, the field is becoming more competitive as ever. There are dedicated college graduates with marketing and business degrees as your competitors if you want to get into this field. The problem lies in the false hypes that Paid Social Media Jobs try to generate and get people to buy its membership. You are promised to land an easy job just by watching a few training videos, but it’s not nearly enough to turn you into a social media expert worth hiring. When you are done with the course, you may be a beginner in social media marketing at best. 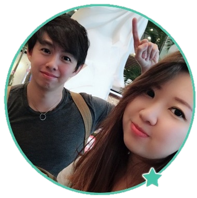 Paid Social Media Jobs uses the typical work-from-home, single mother success story to lure internet users into buying their membership. As with many other online scams, the story starts with a single mother, Annie Jones who was struggling financially until she discovered Paid Social Media Jobs and has been making easy money from home every since. At the end of the sales pitch, you are offered to get a membership for $47, a 50% off the original price. You cannot get a glimpse of the jobs available in the job portal, nor can you see what training contents and tools are offered for the paid members before you purchase the membership. You will only be given access after you have made the payment. However, the final price is not $47 as Paid Social Media wants you to believe. If you attempt to exit the browser window, a pop up will appear to stop you from closing the page. If you choose to stay, the price will be cut down to just $27. This is a big red flag that appears in many online scams we’ve reviewed earlier, such as Learn How to Academy and Secure Home Profits scams. If the program is really as good as Paid Social Media Jobs claim, why would they subject themselves to discount after discount? It’s as if they are begging you to buy their membership, and it’s exactly what’s happening right here. If you want to make serious money online, there are better alternatives out there that are much more promising than paying for an unknown program that keeps you in the dark. What’s Inside the Members Area of Paid Social Media Jobs? 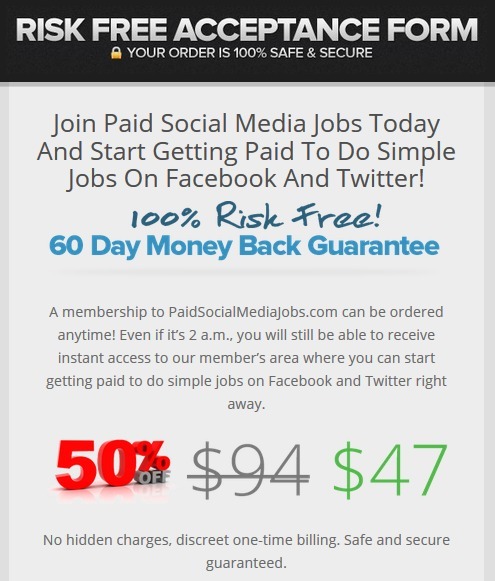 If you bought the membership of Paid Social Media Jobs in the hope of making easy money online, you will be sorely disappointed. The marketplace in the members area is nothing like a job portal. It’s just a platform for desperate job seekers to place their advertisements. If you think about it, the job portal of Paid Social Media Jobs is just a poor replicate of established freelancer sites like fiverr.com and odesk.com. What’s more, you can place your job seeking advertisements on these 2 websites without paying a cent. I can’t find signs of interactions between potential employers and job seekers in the platform. There’s no ratings or feedback whatsoever on the advertisements by job seekers. I doubt if anyone in Paid Social Media Jobs platform gets hired at all. A big problem with the courses in Paid Social Media Jobs is that you are taught WHAT is social media marketing and WHY it is important, but it doesn’t teach you HOW to do it. In the first part of the course, you are taught to match the needs of your potential clients in order to be successful – you should make managing social media easy for your client, address their fears of potential mismanagement, and make them feel it’s worth spending money for your service. Great. But HOW do I do it? Paid Social Media Jobs didn’t teach me at all! If you want to get advanced training program within Paid Social Media Jobs, you have to visit their redirected websites which contain all sorts of Private Label Rights (PLR) ebooks. PLR ebooks are those that contain generic contents where anyone can relabel it and sell it away. 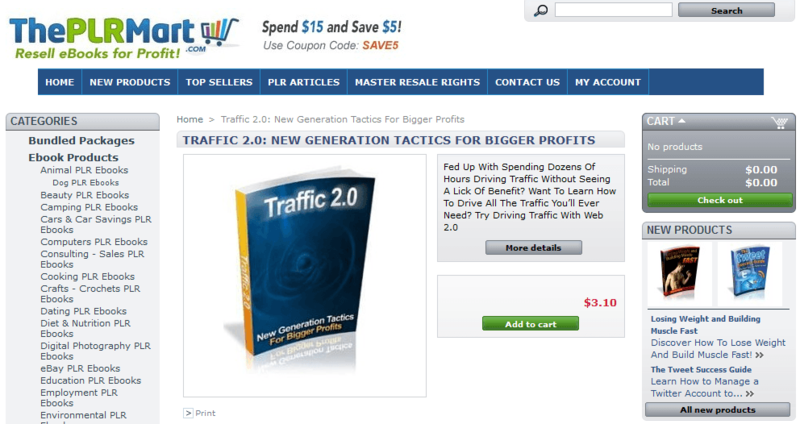 You can hardly get any useful information in these ebooks, and they are not geared towards social media marketing at all. What’s more, you have to purchase the PLR ebooks. It doesn’t come with your Paid Social Media Jobs membership. Although I wouldn’t call it a complete scam, I strongly discourage you from buying Paid Social Media Jobs because it doesn’t offer anything helpful. Thanks! I was a bit skeptical about the site, i sent them an email but what i got is “Address not found” and that’s how i landed on your site to find out about paid social media. If you have not put up this blog i would have been a victim. Am a blogger and i would love to make money online. I do believe making money online should not be that tasking, full of hidden agenda and the likes. Thank you once more, i appreciate.